(Phys.org) —Energy storage solution provider SustainX has announced that it has built an isotherm compressed air energy storage (ICAES) system in New Hampshire. The purpose of the system is to provide energy companies with a cleaner way to store energy produced by alternative energy sources such as solar and wind. SustainX reportedly received $5.4 million from the U.S. Department of Energy to help build the demonstration system. People have known for hundreds of years that it's possible to store energy using simple methods—pumping water up a hill and then allowing the force of gravity to turn cogs on its way down later to recoup energy, for example, or on a bigger scale, pumping air into a cavern then using its force at a later time to drive a turbine, is another. Until recently, however, such methods of energy storage have not been able to compete with batteries—at least on a large scale. That might be about to change, however, as the new ICAES system in New Hampshire demonstrates. Currently, the new plant pulls in electricity from the grid and uses it to compress air which is stored in big tanks. Electricity can be created at a later time by releasing the air to drive a turbine. The long term plan is for utilities to use such technology to store electricity generated using non-continuous sources, such as from wind or the sun. Researchers have looked into using compressed air as a battery before, what's new this time is the proprietary design created by the team at SustainX—its more efficient and is done at a much larger scale (it's capable of producing 1.6 MW of power when releasing the compressed air) than ever before. Also, they have developed a technique of spraying water into air filled cylinder chambers which allows for capture of heat generated by the compression process. 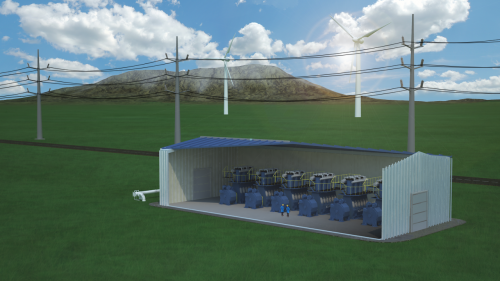 SustainX says its ICAES systems are better than other methods of energy storage because they can be sited virtually anywhere (no need for a cavern), because they are flexible (easily scaled), because of the low installation and ongoing costs, and because installations will last for 20 years. It's also far cleaner than batteries or other systems that store compressed air but require natural gas to retrieve the energy from them. SustainX is now in the process of using its newly built plant as a demonstration system to entice buyers. What is the thermodynamic efficiency calculated to be? Crony capitalism at its finest. Would it be efficient enough to justify storing power during off peak hours to sell power back during peak hours if not using specific renewable sources? If space is not an issue, would it make any sense as a backup power source instead of a generator? If the technique is not economically dependant on a power system using renewables it would be more likely to expand market penetration quickly. This is basically a natural gas turbine where the compression stage runs on stored electricty. Most of the energy is still from nasty fossil gas. Isothermal means "at constant temperature". The problem with compressed air is that it heats when you pump it, and a part of the energy is lost as the heat escapes. Conversely, air cools down and shrinks when released from pressure so that again a part of the energy is lost because the pressure in the tank drops faster than you're letting the air out. So the isothermal process involves cooling the air when it's being pressurized, and heating it up when it's being released, and assuming you can do that without using too much extra energy, the efficiency of the compressed air energy storage improves. One way of doing that is doing the process really really slowly and gradually so the heat circles back through the ambient environment with little loss. Another one is using something like water to store the heat and return it back to the system by passing the cold gas through the hot water heated by the compression of air previously. Would it be efficient enough to justify storing power during off peak hours to sell power back during peak hours if not using specific renewable sources? It might. Depends on the energy stored (MWhours. But even their website only gives the power value -not the energy value for the planned installation). If the amount of energy stored isn't very large it's better suited for evening out mismatches in load spikes vs. supply spikes from renewable sources. Of course the scaleability is simply achieved by 'add more tanks'. "The problem with compressed air is that it heats when you pump it, and a part of the energy is lost as the heat escapes. Conversely, air cools down and shrinks when released from pressure so that again a part of the energy is lost because the pressure in the tank drops faster than you're letting the air out"
In some situations that may be an asset rather than a problem. Example: Electrical usage goes down at night when it is cooler and people sleep. Electrical usage is often up in late afternoon when it is warmer. So if get timing right for a peek hours game, may get heating at night and air conditioning/cooling during the day. Even if is random, may be half the time when the the heating or cooling effect matches the temp change you want in living space. Reducing energy spent on air conditioning the normal way may help offset cost of having a big heat exchanger. Depends. a system of gas fired powerplants that kills the climate (and us with it) is certainly 'more expensive' than a storage unit that takes 100 years to amortize. Not everything can be bought with money. Where (species-)survival is concerned there is no savings in dollars that is worth going extinct for. In this case, since the long amortizing time comes from the supposedly abysmal storage capacity, the whole comparison is moot because the air tanks will never displace the gas fired powerplants - simply slightly reduce their use over the next 100 years. If heating and cooling are desired, dedicated heat pumps would be more desirable, combined with a heat storage mass. That would give you 4-5 times your input energy in heat/cold. A mass of gravel under a house would be cooled down by a heat pump, the heat being used to warm the building above, and during daytime the AC would circulate water in a pipe to sink heat into the cold gravel - to be used again the next night. That this system can produce 1.6MW is nice, but irrelevant. How long can it sustain this level of discharge. Energy is measured in Joules, not Watts.